Below: Northfield Laboratory Complex 1978. 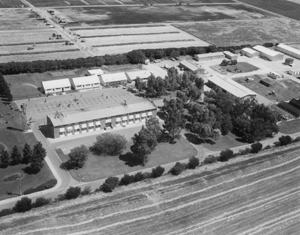 Development of the Northfield Laboratory complex in close proximity to Adelaide was critical to expansion of research capacity. Below: Loxton Research Centre laboratory building in 1973. Below: The Dried Fruits Marketing Board in 1955. Agricultural marketing boards played an important role in national and overseas marketing of agricultural produce for more than 50 years. Geoff Strickland is standing third from left. Following the resignation of A.R. Callaghan in early 1959, Arthur Geoffrey (Geoff) Strickland, C.B.E., M.Ag.Sc., F.A.I.A.S., was appointed Director of Agriculture. He had been a senior officer in the Department since 1934, being a highly respected Chief Horticulturalist from October 1935 until his promotion to become the first Chief of the newly created Division of Plant Industry 20 years later. For the first half of the 1960’s, a Liberal Country League (L.C.L) government continued its long run in office which began in 1933. Strickland’s first Minister was David Brookman (who took up the portfolio for the last year of Callaghan’s tenure), but in March 1965 the first South Australian Labor government for over 30 years was formed under Premier Frank Walsh who was succeeded by Don Dunstan two years later. The L.C.L. returned to power in April 1968. Strickland’s Ministers were David Brookman (L.C.L. ), Gabriel (Gabe) Bywaters (A.L.P. ), Tom Casey (A.L.P.) and Ross Storey (L.C.L.). At this time the Labor Party in South Australia did not have a well-developed agricultural or farm policy so that the changes of government did not make a great deal of difference to the directions in which the Department of Agriculture moved. The decade of Strickland’s directorship saw great developments in a number of areas. The Department’s support from outside research and extension grants grew massively. At the beginning of the decade, they accounted for about one eighth of the net cost of the Department, (after allowing for revenue from fees and sales of produce and the reimbursement for services rendered under the Commonwealth Quarantine and Commerce acts). By the time Geoff Strickland died in January 1970, the proportion had more than doubled, to 26%. Key staff changes early in Strickland’s directorship included the transfer of R.I. Herriot to become Principal of Roseworthy College in 1962, the resignation of Scientific Liaison Officer H.P.C. Trumble to join C.S.I.R.O. Head Office staff and the promotion of A.J.K. Walker to Chief, Division of Plant Industry. Trumble was replaced by V.K. Lohmeyer (previously Agricultural Botanist and supervisor of the fruit fly eradication team), while the new Chief Agronomist was N.S. Tiver until he resigned to become a consultant, and was replaced by F.B. Pearson. When Herriot transferred, the Extension Services and Information Division was downgraded to a Branch, providing services to the “operational” branches within the Animal and Plant Industry Divisions. The Extension Branch, headed by P.C. Angove, also included the increasingly important Farm Management Economics unit. This was greatly strengthened by the appointment in late 1958 of Alan A. Dawson as Senior Economist and the start of a steady stream of agricultural economics graduates from the cadetship scheme. The most significant development during Strickland’s directorship was undoubtedly in the area of research facilities. The most far-reaching of these arose from the SA Government’s decision to transfer the old mental hospital dairy farm at Northfield to the Department of Agriculture, paving the way for major development of laboratories, experimental fields and other specialised facilities. development of 700 acres (c. 290 ha) for a dairy research station. A specialist pig research unit was proposed in 1963-64 but did not come into operation until 1970. 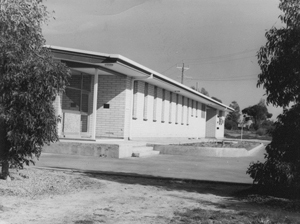 By 1964 Adelaide-based research staff of the Agronomy, Soils, Dairy and Horticulture Branches had moved into their new laboratories. In 1966 a high quality quarantine station was constructed to allow for the secure introduction of new plants from overseas (initially potatoes and vines). Its scope was greatly enlarged in 1978. Access to such a range of modern laboratory facilities, so close to Adelaide, provided a huge fillip to the morale and enthusiasm of research and technical staff. Many of these developments were financed from the State’s Capital Works program but very substantial funds were also granted by a number of primary producer research bodies. The most notable of these was the large grant made by the South Australian Wheat Research Committee which administered the research funds collected from wheat growers. Specialised equipment for small scale field experimentation was designed and built by Departmental staff. An interesting and very valuable by-product of the Northfield development was the creation of space and communal facilities which could be available for appropriate after hours social gatherings for all departmental staff. In this connection, the influence of Marshall Irving, the second most senior officer in the department, who with enthusiasm took on the role of Chairman of the Department of Agriculture Social Club, cannot be overstated. Over a period of years the Northfield site played a major part in building and sustaining a sense of family unity across the whole department. This was a very significant factor in fostering an ethos of willing and fulfilling service to the agriculture industries. In 1965 a Research Centres Branch was created to provide Head Office based oversight of the country research centres. These were the centres dealing with issues affecting grazing animals (other than dairy cattle) and mixed cereal/livestock farming, i.e. Kybybolite, Struan, Turretfield, Parndana, Wanbi and Minnipa. It also secured a base for biometrical services for the whole Department. In the early 1960’s, a number of new country research centres were being developed. The largest of these was Loxton Research Centre which gradually replaced the old Berri Experimental Orchard as the centre for studying the problems of irrigated fruit, vegetable and vine growing in the Riverland. Sims Farm, a property near Cleve was bequeathed to the SA Government by a Mr Sims to be developed as a local research centre. It never achieved this status but was share-farmed and used for seed production and some cereal trial and demonstration work. In 1961-62 land was acquired at Milang on the western shore of Lake Alexandrina and, largely with Commonwealth Extension Services Grant funds, was developed as a small but useful site for research on irrigated pasture management practices. Land was purchased at Lenswood in 1963-64 and developed as a horticultural research station dealing with cool temperate climate horticultural crops. Lenswood replaced the old Blackwood Experimental Orchard. Further information about Lenswood and Blackwood horticulture research centres. In 1962-63 a new departmental publication titled “Experimental Record” was established. This provided a quicker avenue for airing the results of research projects than scientific journals, and was more appropriate than the extension focused SA Journal of Agriculture. The advent in the late 1950’s of the joint Commonwealth and State’s funded Australian Journal of Experimental Agriculture & Animal Husbandry which catered for fully refereed scientific papers about results from applied research. Following the disastrous Kongorong fire, south of Mount Gambier, in January 1959, the Government formed a Bushfire Research Committee. Its role was to investigate economic land use methods to minimise the effects of fires and to advise landholders on methods to reduce fire losses. The committee was chaired by Dr Jim Melville (Director of the Waite Institute). Further details of Dr Melville’s career are available from the Australian Dictionary of Biography website. Other members included the Director of Agriculture, the Conservator of Forests and three primary producers. The committee had an annual budget of £100,000 and, although the brain child of Premier Tom Playford, was responsible to the Minister of Agriculture. A short time after its creation, the Bushfire Research Committee’s terms of reference were widened. They were expanded to increase public awareness of bushfire causes and risks, and to encourage people to take precautions to prevent fires starting and to protect their properties from bushfires. a post-graduate student at the Waite Institute was also supported to experiment with desiccant herbicides for early season creation of firebreaks. press, radio and television publicity. exhibits at the Royal Adelaide Show. the naming of a selected koala, call Smokey housed in a specially marked enclosure at the Adelaide Zoo. The Bushfire Research Committee was disbanded in May 1977. The majority of its programs were absorbed into the newly-created Country Fire Service (replaced the former Emergency Fire Service), while matters relating to farm management remained as functions of Agronomy Branch. Following the Great Depression and emergence of the Country Party, a number of government-backed marketing boards with strong producer representation were created. Because export markets were critical for many rural industries, these Boards were often formed under Commonwealth legislation, sometimes with the backing of complementary State laws. In South Australia, a number of State statutory marketing boards were established. Former and current Department of Agriculture senior officers were sometimes members or chairman. The decade of Geoff Strickland’s directorship probably represents the pinnacle of this involvement.The most significant was the Australian Barley Board jointly established by South Australian and Victorian Acts of Parliament to provide for orderly marketing of Australia’s barley crop locally and overseas. SA and Victoria produced about 90% of the barley crop. The first chairman was W.J. 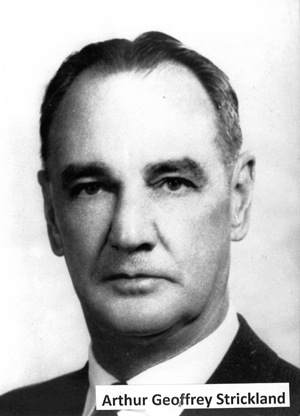 Spafford, initially while he was Director of Agriculture and later in retirement, until his death in 1962. He was followed by A.G. Strickland until his death in 1970, then the Department’s Chief, Division of Plant Industry and later Assistant Director A.J.K. Walker. 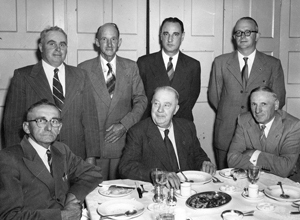 The South Australian Egg Board’s long serving Chairman was C.F. Anderson, Chief Poultry Advisor, followed by R. B. Fuge (who was in later year the Department’s most senior poultry officer) and finally J.T. Feagan. Within the area of fruit and vegetables, there were a number of State marketing boards dealing with potatoes, dried fruits, citrus and apples and pears. Geoff Strickland and his successor, Chief Horticulturalist, Tom Miller served on these boards, along with other Departmental staff over many years. The Metropolitan Milk Board was responsible for setting procedures and standards for the distribution of whole milk in the wider Adelaide area. Its long serving Chairman, Brian Hannaford, had been the department’s Senior Milk Products Officer before taking over the job, full-time. The program of in-service training for advisory officers in extension techniques began during Callaghan’s directorship in the 1950’s, and was strengthened during Strickland’s directorship. SA Public Service regulations provided opportunity for part-time study of approved subjects at approved institutions to enable officers to obtain knowledge for their current or possible future duties. During Strickland’s term as director, scientific and technical staff were encouraged to gain specialist knowledge at selected tertiary education institutions. This included taking analytical chemistry subjects at the South Australian Institute of Technology (e.g. for laboratory assistants), or upgrading a Roseworthy Diploma of Agriculture to a Diploma of Agriculture Technology (R.D.A.T.) by taking paid study leave for a year to attend Roseworthy College. Post graduate studies were encouraged through the provision of full time study leave to undertake an honours year, a master’s degree as an external student, or studies leading to a Ph.D. Allocation of resources to support these post-graduate training arrangements was based on an assessment of the ability of the officer concerned and the relevance of his proposed area of study to future departmental needs. During the 1960’s, a number of skilled scientific and technical officers became involved in short term aid projects in developing countries, utilising their special expertise in various fields. These were often sponsored by United Nations agencies (e.g. the Food and Agriculture Organisation). Further information about Overseas Projects. In 1969, Geoff Strickland was diagnosed with cancer, and died in January 1970. Marshall Irving was appointed Acting Director, and was subsequently appointed Director after Strickland’s death.